Lisbon was our last stop on our short Portugal tour so we were primed to fall in love. And fall in love we did. Lisbon is everything you hear it is - old, hip, hilly, gorgeous, a little dirty - and more. It seems everywhere you look buildings are being renovated or are sitting in a complete ramshackle sort of mess. 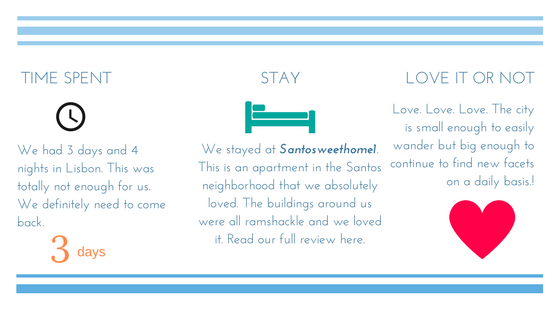 Of course, ramshackle mess is what we love about a place, so we felt right at home. This is what first captured our hearts and had us thinking of settling down here. Then we wandered around still more and found a plethora of amazing restaurants, cafes, shops and street art. All things that make for a great city. Then we walked down to the river; which oddly feels like you are on the sea, and fell in love some more. Not necessarily because the riverfront is so nice (it's really quite industrial) but because the river itself is so lovely. Everything about this place feels like it should. I don't really know how to explain it. You just know something feels good when it does.